Nice to see our Eigen coat stand at No. 6 on the Real Homes Best coat stands and Racks list for 2108. 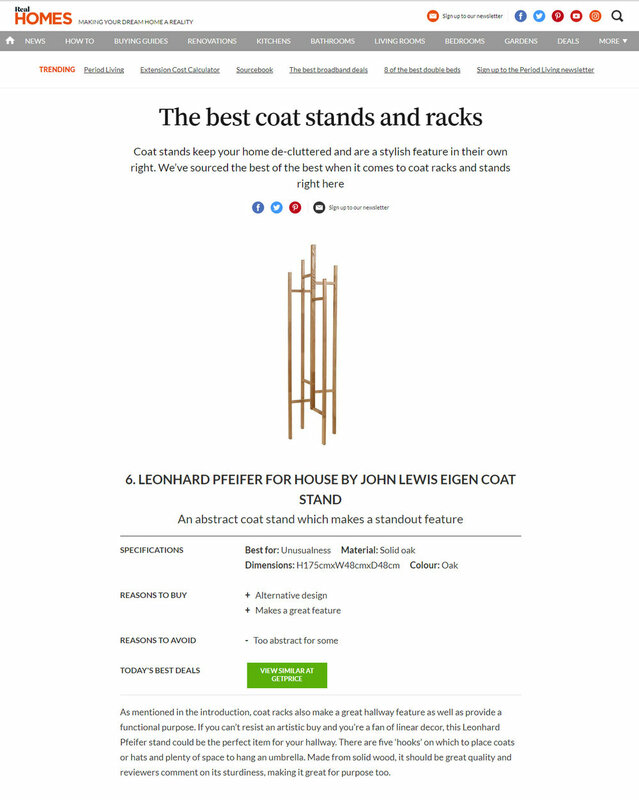 Awarded a Design Guild mark in 2012 when it was first launched, the Eigen coat stand continues to be a best selling product offering the design buyer excellent value for money. Whether your partner has a habit of leaving their coat on the banisters or you find yourself tripping over an umbrella that was left propped up by the back door, if you’re tired of outside attire being left around the house, investing in a coat stand could be the answer to keeping things de-cluttered and hazard-free. Many households these days keep their coats in a cupboard, but if you’re often inviting guests into your home, a coat stand is the perfect place to leave their outside wear. A coat stand not only removes that awkward scenario of finding a place to put outside gear; it creates a bit of ceremony that can leave your guests feeling thoroughly welcomed. A design of a coat stand can be either one of two things - practical or stylish. If you’re a fan of quirkiness and fancy finding one that is completely unique, we’ve taken a look at retailers such as Wayfair or John Lewis for a selection of sculptures that also double up as somewhere to hang your coat. As mentioned in the introduction, coat racks also make a great hallway feature as well as provide a functional purpose. If you can’t resist an artistic buy and you’re a fan of linear decor, this Leonhard Pfeifer stand could be the perfect item for your hallway. There are five ‘hooks’ on which to place coats or hats and plenty of space to hang an umbrella. Made from solid wood, it should be great quality and reviewers comment on its sturdiness, making it great for purpose too.